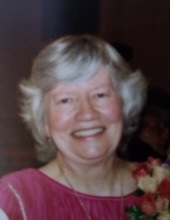 Anita Joyce (Indrebo) Cooley, 87, of Strum, Wisconsin, passed away on Monday, January 21, 2019 at her residence in Strum, WI. Anita was born on February 4, 1931, on her beloved family farm in rural Strum. She married Charles Cooley on March 6, 1959 in Redding, California. Anita graduated from UW-Eau Claire and enjoyed teaching elementary school in Wyoming, Montana, and her hometown of Strum. She enjoyed family gatherings, traveling, and singing praise music. Anita is survived by her husband of almost 60 years, Charles, brother Robert Indrebo, sister Rebecca (Indrebo) Coggins, brother Thomas Indrebo, children Perris Cooley of Eau Claire, Wynter (Cooley) Stearns of Eau Claire, Rachel (Cooley) Vestnes of Eleva, Jon Cooley of Elk Mound, Laura (Cooley) Reinders of Strum, Israel Cooley of Cleghorn, Elisabeth (Cooley) Anderson of California, Joshua Cooley of Eau Claire, 30 grandchildren, and soon to be 7 great-grandchildren. She was preceded in death by her beloved parents, Palmer Leonard Indrebo and Ann Oneida (Halverson) Indrebo, and her sister, Rosemary (Indrebo) Campbell. Funeral services will be held 11:00 am, Friday, January 25, 2019 at Pleasant Valley Christian Center (W1745 Easterson Rd, Eleva WI) with Gabriel Cooley officiating. Burial will follow at St. Paul's Cemetery in Strum, WI. Visitation will be from 10:00am until time of services at Pleasant Valley Christian Center. To send flowers or a remembrance gift to the family of Anita Joyce Cooley, please visit our Tribute Store. "Email Address" would like to share the life celebration of Anita Joyce Cooley. Click on the "link" to go to share a favorite memory or leave a condolence message for the family.